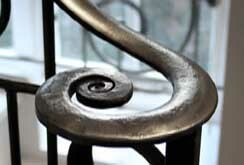 The surface of forged steel has a rich character full of tone and texture. However, it will tarnish if the steel gets wet and it should protected with a barrier coating. Clear lacquer can be used but it does tend to mask some of the surface's nuances and character, it is also difficult to reapply. Instead, we prefer to use a wax coating to protect our work. The steel is first cleaned and burnished with a wire brush, then a special wax paste is rubbed onto its surface with a cloth. This soon hardens to a tough clear finish which does not easily rub off and is easy to reapply. The traditional method of protecting forged steel was to use beeswax but this will yellow with age.The wax we use is a synthetic microcrystalline, non yellowing wax developed by the British Museum. This is used to protect their suits of armour and other metalwork, it also has a Royal Warrant! Forged steel protected with wax has a grey black variegated appearance but if a more uniform grey is required we can have the steel sand blasted before it is burnished. Certain items such as handrails are often regularly handled and over a period of time their wax coating may eventually wear away. Unlike paint or lacquer, it is relatively quick and easy to reapply the wax. If the steel has lightly rusted or tarnished, it can be cleaned with fine wire wool (or scotchbrite) then re-waxed. Just like fine furniture, forged steel needs care and maintenance, though though only rather infrequently.